Q: What is ethnicity and why is it important? A: Ethnicity refers to shared hereditary characteristics like environment, culture, religion, diet etc. Some of these factors are reflected in our DNA and the degree to which people from different cultures in different parts of the world are affected by certain diseases and ailments. For example, people from the West Indies are more prone to sickle cell anaemia. People from Punjab are more likely to suffer from heart and liver disease than people in the West. Identifying ethnicity is particularly helpful in the planning of medical services to meet the needs of immigrants from different parts of the world. 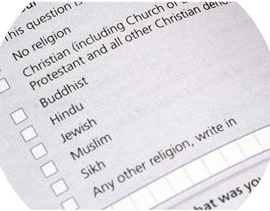 Q: What is the link between ethnicity and religion? A: Religion is considered relevant to ethnicity because those sharing a religion in a particular part of the world, often share a common diet and lifestyle. 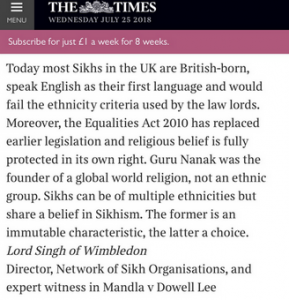 Q: What was the Mandla Case and why is it sometimes mentioned in Sikh discussions on ethnicity. A: The Mandla Case was fought in 1982. 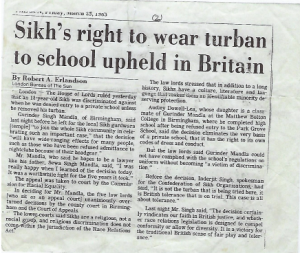 It concerned a Sikh schoolboy Gurinder Singh Mandla who was being denied entry to a school wearing a turban on the grounds that it was against the school rules. The Head agreed that it was religious discrimination but not against the law. At the time there was no law against religious discrimination. Q: The 1976 Race Relations Act protected people against discrimination on the grounds of race, nationality and ethnic origin, but not against discrimination on the grounds of religion. A: The then Commission for Racial Equality (CRE) wanted to try to prove that Sikhs were a race. In a meeting in my house with representatives of Bindman and Partners (solicitors for the CRE), the Barrister Harjit Singh and myself, I advised against the use of race as the concept of different races was against Sikh teachings, which emphasise we are all members of one human race. Instead we agreed to go for the less rigid concept ethnicity, on the grounds that most Sikhs in the UK at the time came were born in the Punjab, spoke Punjabi as their first language, shared Punjabi culture and common diet. The case went up to the House of Lords where the Judges ruled that for the purpose of protection against discrimination, we could be considered an ethnic group. Q: Does this mean that Sikhs are a distinct ethnic Group? A: No. It simply means that Sikhs from any part of the world, including converts of any ethnicity, are entitled to protection against discrimination while in the UK as if they were a distinct ethnic group. We still retain the ethnicity with which we were born. Our DNA and susceptibility or relative immunity to some diseases cannot be changed by legislation. Q: Are there any advantages in writing ‘Sikh’ in the ethnic tick box? A: It is claimed that monitoring will result in improved opportunities in employment and in the provision of services to the Sikh community. In reality, ethnic monitoring can only provide a broad snapshot of relative disadvantage. There is no evidence of any community actually benefitting from ethnic monitoring. On the other hand there is clear evidence of Jews and Muslims using political lobbying to enhance their position. Q: Are there any disadvantages in writing ‘Sikh’ in the ethnic tick box. A: Yes. Firstly, If a large employer, like the BBC were monitored to see if they were employing an acceptable quota of Sikhs, it might be shown that they were employing an acceptable number of ‘supposed ethnic Sikhs’. 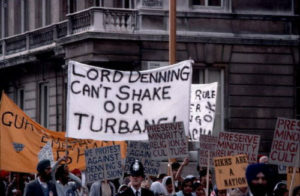 It would not reveal any discrimination against visible identity Sikhs. 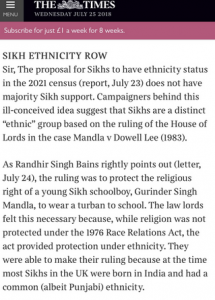 It should be remembered that the Mandla Case was fought to protect Sikh identity. Practicing Sikhs and non-practicing Sikhs would be seen as one and the same. Q: Shouldn’t non-practicing Sikhs be protected by law. A: Of course. As Sikhs we should be committed to protecting all people against discrimination, religious or otherwise. However, in reality, Sikhs without a visible identity, suffer no more discrimination than say, Hindus and Muslims. We should not compromise the Gurus’s teachings to give additional protection to those not committed to Sikh teachings. Q: Why do you feel strongly against Sikhs calling themselves an ethnic group. A: In the 60s I saw a Daily Telegraph crossword with a clue-4 letters; a Punjabi Hindu, The answer the next day was ‘Sikh’. In schools nothing was known about Sikh teachings and we were described as martial race or tribe. Hindu leaders insisted that Sikhs were simply a sub-set of Hindus. Some of us worked hard to show that the uplifting teachings of our Gurus constituted a distinct religion that in its tolerance and respect for different beliefs had much to offer today’s world. Through broadcasts and the media, in interfaith meetings and in lectures across the world, including the Vatican, and in discussions on the school curriculum, we managed to get Sikhism recognised as one of the six major religions of the world. Sikhs in the UK, Canada and many parts of the world are competing successfully without ethnic monitoring. It is sad to see some people, for questionable motives trying to reduce us to some sort of ethnic tribe to be monitored and counted like some sort of endangered species. Sikhs should focus on trying to ensure that all Sikhs enter ‘Sikh’ in the religious tick box with pride in our Guru given identity.